It’s so easy to take your liver and kidneys for granted, especially because they chug along day after day, working their magic without you having to lift a finger. Not only does your liver make and store energy for the body (amongst over 500 other functions! ), it also helps to turn substances which can’t be used by the body into something that dissolves in blood so that it can be carried to the kidneys. Your kidneys also have several important functions. These two little bean-shaped organs continually filter your blood for toxins, flushing out waste products along with excess water. They also help keep your electrolytes, including sodium, potassium, and manganese, in balance. These two organs also play a critical role in removal of nitrogen from the body. Nitrogen is an important part of our bodies – amino acids (aka the building blocks that make up the proteins in your hair, muscles, skin, and other important tissues) and DNA (which probably doesn’t need an explanation of importance, but as a basic refresher: DNA defines who you are and what you are like in many ways) both contain nitrogen as a critical component of their molecular structure. When your liver breaks down proteins, it produces ammonia, which contains nitrogen. The nitrogen then combines with other elements (such as carbon, hydrogen and oxygen) to form urea, which is a chemical waste product that can be transported through the bloodstream. The urea travels from your liver to your kidneys through your bloodstream. Healthy kidneys filter urea and other waste products from your blood, causing it to leave the body through urine. 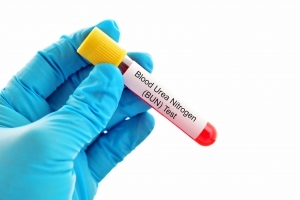 A Blood Urea Nitrogen (BUN) test measures the amount of nitrogen in your blood that comes from urea. A BUN test is done to see how well your kidneys or liver are working. If your kidneys are not able to remove urea from the blood normally, your BUN level rises. Heart failure, dehydration, or a diet high in protein can also make your BUN level higher. Liver disease or damage can lower your BUN level. A BUN test may be done with a Blood Creatinine test. The level of creatinine in your blood also tells how well your kidneys are working. A high creatinine level may mean that the kidneys are not working properly. Blood urea nitrogen (BUN) and creatinine tests can be used together to find the BUN-to-creatinine ratio (BUN/creatinine). A BUN-to-creatinine ratio can help your doctor check for problems, such as dehydration, that may cause abnormal BUN and creatinine levels. Many medicines can interfere with blood test results. Your health care provider will tell you if you need to stop taking any medicines before you have this test. DO NOT stop or change your medicines without talking to your provider first. Do not forget to bring your LabFinder Order and Insurance Card to your appointment.